I might be a little behind the 8-ball, but one can’t keep up with everything, especially with two teenagers running around my house. Now, they’ll be the first to tell me that I know nothing – NOTHING! – but yet, I’ve been more ahead in trends than my 16-year-old daughter. Hey, I’m the one who tells her that my favorite bands don’t play on regular stations, and I fork out $$ for satellite radio just so I can hear some decent music. So I was trolling the sci-fi web the other night, picking through my favorite sites and lo and behold, I tripped upon a website regarding Space 2099. Space 2099! Really? Eagerly I rifle through the pages, hoping a tiny tidbit of info would pop out and get me stoked. 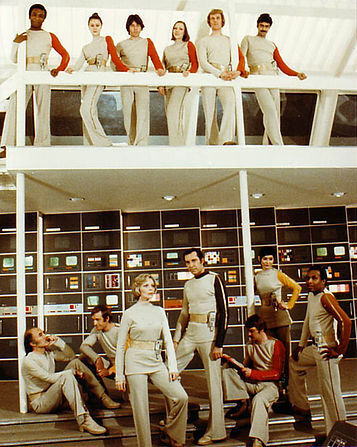 I remember the old series, “Space: 1999” back in the seventies when I watched it with my mother. Ma got me hooked on sci-fi as a tiny tot; I can say that I remember watching the original “Star Trek” on its first run, and then on its multitude of reruns, as well as Dr. Who with Tom Baker (on PBS at the time, who also had the foresight to air “Monty Python”). Look at their outfits: they were so 1970s, and yet had a practical sensibility about them. Designed for comfort and ease of movement, their stylish togs nodded to the fashion of the day (Bell bottoms? Why not!). And this is what impressed me: those costumes were unisex. No deep cleavage cuts and short hemlines for the ladies, no sir. How else can one chase around evil in dystopian universes when one has to spend a portion of one’s concentration on whether or not one’s secrets might be revealed? Besides, if a character’s outfit didn’t fit, he or she could exchange it with anyone, male or female. How practical is that? Certainly the folks back at WANDER looked to economize even then. Barbara Bain and Martin Landau (who would go on to be an even greater character, Bela Lugosi) ran Moon City with a combination of authority, grace and structure. They didn’t even give a second thought to the fact that now the moon was its own ship steering through the stars and its (unlikely) departure from Earth’s influence might wreak final havoc on tides, coastlines and general principles of physics. They were busy folks, and who has time to worry about such things when there’s Dorcons to chase? Regrettably, there were only two seasons and 48 action-packed episodes to enjoy. One might catch it in repeats here and there, but it generally disappeared from view. So when I caught the news that it was announced (back in 2012 – how did I miss that?!?!?) that there’d be a 2099, naturally I was intrigued. I’m certain that this incarnation’s going to have a lot more bells and whistles than the decidedly low-budget tactics that made the original so charming. But the sucker that I am, I’m sure I’ll be pulled into its vortex and grab all the episodes I can.